For years, our quaint brick & mortar storefront was the center of all production activities at World Spice. Tucked away behind Pike Place, we used a pan for toasting spices, kept in a corner behind the front counter. In that one little pan we toasted all the spices for our blends, letting the aromas bring inquisitive noses wandering into the front door, wondering at the smells…. We’ve grown since then, and the pan has been retired in favor of a multi-rack oven at our production warehouse. We still toast the spices for our house blends in-house, though. You can do the same at home using a heavy bottomed pan that is likely already in your kitchen. Toasting your spices is a great technique to know. Toasting spices intensifies their flavor, bringing out the aromatic oils and adding complexity to their taste by layering in a warm, toasty flavor. It also makes your kitchen smell amazing! How do I toast my spices? 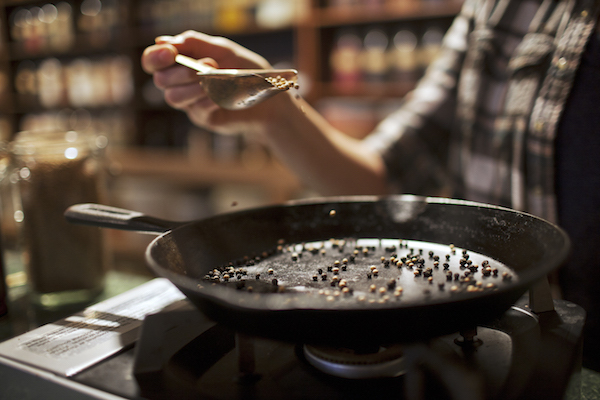 For toasting spices, you should begin by selecting an appropriately sized pan. You’ll want to make sure you have room to spread all the spices out in a thin layer. This will ensure that all the spices are toasting evenly. The heavier the pan the better- I like to use my cast iron skillet but any heavy bottomed pan will work just fine. Warm the dry pan on a burner over medium heat, and then add the spices. Shake the pan or stir the spices frequently to ensure even toasting on all sides. You’ll know things are really cooking when you start to smell them. Keep toasting and shake/stir more frequently as the toasting continues. Most spices will toast up nicely in just a few minutes. When the spices are evenly toasted but not burnt, remove the pan from heat and transfer the spices to a heat proof bowl. Tip: When the spices are done toasting remove them from the pan immediately because they will continue toasting if they are left in a hot pan. What spices can I toast? Most seeds, barks, roots and other hard or solid spices can be toasted. Some examples are cumin, coriander, fennel, black peppercorns and cloves. For these, toasting in a pan as described above is the easiest method. These spices can be toasted alone or in combination. Most spices of fairly similar size will toast at the same rate. There are some exceptions. Spices with a very high oil content like cloves and sesame seeds toast more quickly. Watch those carefully and remove them before they begin to smoke or burn. Tip: By combining dark spices like black peppercorns with lighter ones like cumin or coriander, you can use the color change on the lighter spices to tell when the dark ones are done. Toast the whole ingredients as described above while the ground spices are standing by in a heat proof bowl. When the whole spices are toasted to your satisfaction, simply add the warm toasted spices to the ground spices in the bowl and mix gently. The warm heat from the toasted spices is just enough to add depth of flavor to the ground ones. We use this technique in blends like Besar and Poudre de Colombo. CAUTION: Toasting chiles is a little bit of a trick. Toasting them adds wonderful flavor, but the process gives off a harsh smoke that will burn the eyes and respiratory tract. If you choose to toast chiles, best to err on the side of a short, quick toast to minimize any smoke and only toast in a well-ventilated area. How long you toast your spices imparts a different range of flavors and can make a difference in how they’re used. A light toasting is nuanced rather than bold, and the flavors of lightly toasted blends like Dukkah and Za’atar are best experienced without long or high heat cooking after the fact. Dukkah is a delightful condiment or crust. This Egyptian blend is traditionally used with olive oil as a dip for bread. Za’atar combines toasted sesame with herbs and used is a great choice to accent roasted meats, hummus or flatbreads. To achieve a light toast, remove the spices from the pan when they are lightly browned. A medium toast adds a well rounded depth of flavor in blends like our Seattle Salmon Rub, Berbere and Harissa. These add wonderful complexity of flavor to your food. For a medium toast, keep toasting until the spices are brown all over and you can smell the aromas. Some of my all time favorites are the darkly roasted blends like Sri Lankan Curry and Kashmiri Garam Masala. These add the deepest, most sultry flavor and can be used to complement bold flavors and even chocolate! For a dark roast, keep the spices in the pan as long as possible, until they begin to smoke consistently. Even when you are shaking and stirring them. Be sure to remove from heat before they ash or burn, though! Toasting spices is just fun. Thanks for this great idea, and for sharing a bit of your history. I can’t wait to try toasting my spices. You won’t be sorry. You’ll really notice a difference in flavor. I’ve been toasting cumin seed then grinding it for years. It makes the most wonderful aroma, and whenever a soup or sauce just “needs something”, the toasted cumin is just right.